Hawaiian boys casualties of WWI, 1917. Julian R. Masomber [Julian R. Macomber], Honolulu. Ekila Kaohi [Ekila Kaoki], Hawaii. Tota Davisfi [Tato Davis], Hawaii. One of the Lieutenants, William Fuller Greshman [William Fuller Gresham], there were 12 men aboard second lifeboat which left the ship that was torpedoed; this is what was reported by the French navy which was received by the French Ambassador residing here, but 11 of them who were ordered to board another lifeboat were not heard from, and it is believed that they were drowned. These people were on the lifeboat which left the ship first; the lifeboat flipped over after it left the ship, and not one of them were recovered. The third lifeboat with the second mate and 18 men; there was nothing heard of them and it is believed that they drowned. From the first news received about the sinking of this American ship, the Aztec, was from the American Consul. The news stated that the ship was torpedoed without time to let out the lifeboats to save themselves, and it was said that after this tragedy, the submarine didn’t give a look back, but disappeared into the dark. This father repeated that he was happy to hear this news, but not over the death of his son. 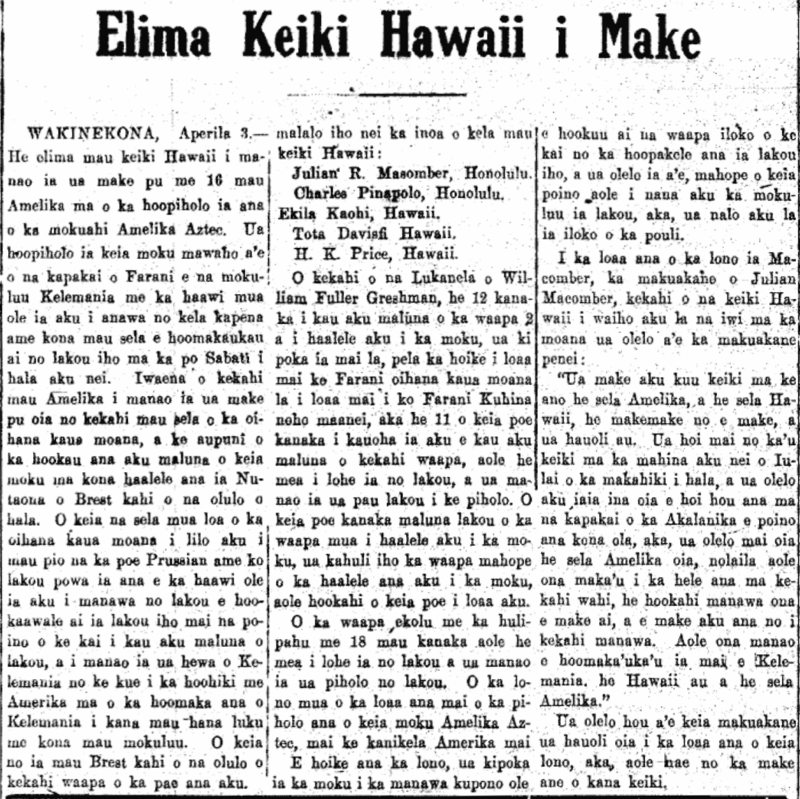 Ke Aloha Aina, Buke XXII, Helu 14, Aoao 1. Aperila 6, 1917. This entry was posted in Hawaiians Abroad, War and tagged Aztec (ship), Charles Kanai, Charles Nakalo, Ekela Kaohi, Henry Rice, John Davis, Julian R. Macomber by nupepa. Bookmark the permalink.